DVI Fiber Optic - Fiber Optic Based DVI Cables: Fiber Optics based cables that exceed the performances of the copper and silver made cables. An integrated DVI-D cable solution which includes the fiber optics components built into the cable and the DVI connectors. This flavor is called DVI Fiber Optic cable and it requires a clearance of 1-1/2" wide conduit. These cables are HDCP compliant. The lengths available are 33-1640* feet. *For cables over 330 ft., please call us for pricing and availability. HDTV Resolutions Supported: DVI Fiber Optic Cables support resolutions up to 1080p. Computer Resolutions Supported: DVI Fiber Optic Cables support resolutions up to 1920x1200. HDMI Extreme Fiber Optic Cables are not designed for permanent in-wall installation. 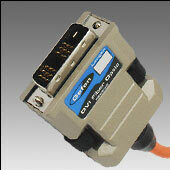 Please use the Gefen DVI 1500HD Extender for permanent in-wall installation.